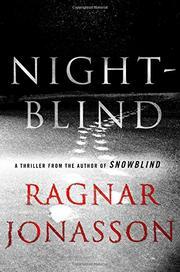 A second case looms for Ari Thór Arason, half the police force of the north Icelandic town of Siglufjördur, when the other half gets shot in an abandoned house. Nothing much has happened in the house near the entrance to the Strákar tunnel since 1961, when one of the twins living there took a fatal header from its balcony. And Inspector Herjólfur, a recent arrival to the community, wouldn’t even be investigating the report of someone seen inside if Ari Thór weren’t down with the flu. As it is, his patrol ends abruptly with a shotgun blast that sends him to the hospital, hovering between life and death. Will it also send Ari Thór, who campaigned unsuccessfully for the position of inspector, into Herjólfur’s place? Not a chance. Instead, the powers that be summon Tómas, the boss who preceded Herjólfur, back from Reykjavík to take charge of the case. So Tómas is also on hand when an even more recent arrival is stabbed to death. To Ari Thór’s chagrin, his old chief insinuates himself into this case as well. It looks as if the eternal second fiddle (Snowblind, 2017) will have enough time on his hands to take care of his son, Stefnir, who’s almost a year old, when his physician wife, Kristín, accedes to the local hospital’s pleas that she return to her job. Maybe Ari Thór will even have the leisure to notice that corruption threatens the local political establishment and that Kristín is thinking seriously of leaving him. The plotting is rudimentary, but the final surprise carries a real shock; the excerpts from a 1982 diary pack a punch of their own; and of course the advent of the Icelandic winter is likely to chill hearts even below the Arctic Circle.